As a gym owner, I spend a lot of time planning the best ways to get my members fit. I have always been part of a movement, exercise, or gym culture, and it’s important to me. However, I will be the first to tell you that the most important thing for fitness is not joining a gym or getting on a workout schedule: it’s what you eat. In reading about my second passion, cars and automotive technology, I’ve noticed a number of (intense) wars on the Internet about what kind of gas to put in your car. If people cared about what they put in their body as much as they worry about what they put in their car, then we would be the healthiest population on Earth! I bet you can see where I’m going here… I recommend Meal 2, and it’s a good representation of what I have been eating for almost a decade (it’s not a fad, and I haven’t died of a heart attack). If your event is longer than two minutes (that’s a fast 800m run! ), then you are an endurance athlete, and slow-burning fat is the best fuel for that aerobic pathway. Becoming a fat burner will make you bonk-proof! Imagine how that could impact your performance at the Hot Chocolate 15K/5K Dallas or the Napa to Sonoma Wine Country Half Marathon. Just like the Internet experts in the car forums arguing about what kind of gas to put in their cars, you’re probably either tired of, or extremely passionate about, the fat vs. carbs debate. Your body will burn carbohydrates — anything from simple sugar to those good “complex carbohydrates” — before it burns fat. There are many theories on why this is the case, but let’s not worry about that right now — just know that sugar burns first, then fat. Slow-burning fat is the best fuel for endurance athletes… becoming a fat burner will make you bonk-proof. The USDA has been promoting a carbohydrate-heavy diet for 40 years. During the same time endurance athletes have also found that “carb loading” helped performance in races. These forces have created the Standard American Diet (SAD), which is primarily high-carbohydrate, low-fat. The problem with this advice is that with the constant feeding of carbohydrate to your body, your cells have forgotten how to burn fat. When you forget how to burn fat, you get insanely hungry when you run out of carbs and you need to refuel. When you can’t refuel properly during a race — whether it’s the New York City Triathlon or the Walt Disney World Half Marathon — you bonk. If you train your body to become metabolically flexible — that is, to burn carbohydrates when they’re there and fat when they’re not — then you can fuel your training runs and your racing just from your own body fat. 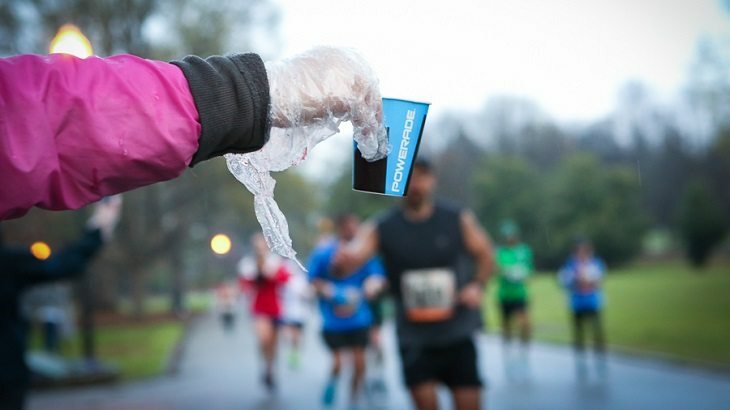 There is no need to carry sports drinks or gels or any food. A 145-pound runner with 15 percent body fat has more than 65,000 calories of energy stored in fat, and you only need about 3,000 to run a marathon! The trick is mobilizing that fat and turning it into energy. It’s easy to train your body to use fat: just eat fat. Well, okay, it’s not that easy. First, you need to cut the carbohydrates so that they’re not there for your body to see first. When you cut the carbs, you need to replace them with something else, and that’s either protein or fat — and fat really is the fuel. How much fat? How few carbs? I like to start by talking about carbs. The general recommendation we (and many others) start with is to limit yourself to about 100 gramsof carbohydrate per day if you’re happy with both your training and your weight. If you want to lean out a little, then you can drop as low as about 50 grams per day, and if you want to put on a little mass you can go up to about 150 grams per day. Of course, this all depends on your current weight: smaller folks will want to be lower, larger folks higher. But you’ll be surprised how low 100 gram of carbohydrate is! In the current food environment, you really do need to pay attention to what you eat so that you can keep your carbs that low. Once you get the carbs figured out, then simply eat fat to satiety. Once your cells know how to burn fat, you can complete your next training run or race with no extra fueling, and you’ll feel great the whole time. My personal best BolderBOULDER 10K time was when I was a fat burner. I ran that race in a fasted state, and it was the best I ever felt. I was never tired, and I felt as if I could run that pace all day long. Next, I want to talk about food quality, not just quantity. 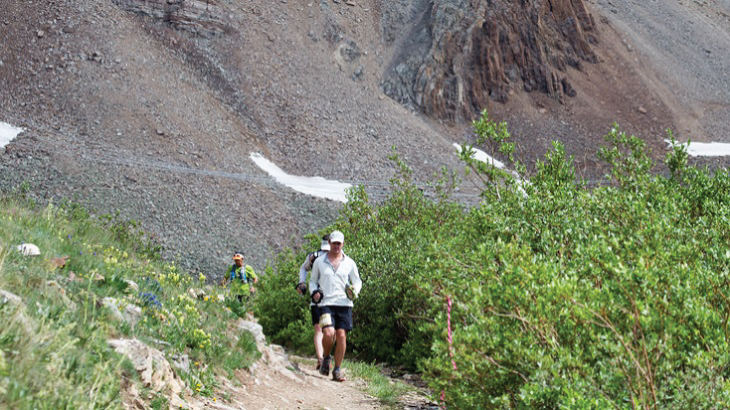 Since you’re an endurance athlete, you burn through more fuel than a couch potato. The more fuel you burn, the more you need to worry about it burning cleanly. You know what’s happening when you’re following that truck that’s belching smoke? During hard acceleration a diesel engine runs “rich,” i.e., it just dumps as much fuel into the engine as it can, hoping that most of it will get burnt. The unburnt fuel is the black soot you see. When you’re training hard (again, don’t do that! ), your body is running in a state where it cares more about generating energy rather than being efficient — it’s dumping fuel through your cells. A 145-pound runner with 15 percent body fat has more than 65,000 calories of energy stored in fat, and you only need about 3,000 to run a marathon. If the fuel you’re burning is high-quality long and medium chain saturated fatty acids, then you’re burning clean fuel because that’s what your cells are meant to burn. The byproducts of the combustion are cleaned up nicely by your cells and you’re generating energy at a sustainable pace. When you’re burning carbohydrates and polyunsaturated fats (PUFAs), your body can’t keep up with the “exhaust”, i.e., reactive oxygen species (ROS). ROS are bad news; they cause lots of damage in your body. And what are PUFAs? They’re specifically the heart-healthy oils like canola and soybean oils that you’ve been told to eat for years. The chemical structure of these oils means that they easily become rancid and burn very dirty in your body. If you are concerned about food quality, you should also avoid grains. Other than being a very cheap source of calories, grains have no redeeming qualities that can’t be found in more nutrient-dense foods. Additionally, grains are high in carbohydrates, so you’ll burn through your 50/100/150-gram limit pretty quickly. People also often have unknown allergies to the proteins in many grains. You’ve likely heard of celiac disease or gluten sensitivity because they’re the most well-known, but all grains contain something that has a good chance of making you sick. So what do I recommend eating? Eat whole-food sources of high-quality meats, lots of vegetables, and natural sources of saturated fats. Stay away from processed foods (vegetable oils, for example, require industrial production and lots of processing) and prioritize food that looks like it came from nature. Limit carbohydrates to become a fat-burner. This approach can be as simple or as complex as you want it to be. I’m pretty boring with my food because I like to keep everything simple. Breakfast is eggs and bacon, lunch is whatever leftover meat I have from the night before, and dinner is a large salad with some meat cooked in fat and a side of veggies. With that template, I never get bored. The rules for becoming a fat-burner are simple, but how do you actually do it? First, be prepared for some discomfort as you convince you’re body to start burning fat. Without the carbs coming in, your body will act like it has nothing to burn and you’re out of energy. As a result, you may find that you’re really tired and cranky — that’s normal. For myself, I remember the transition to a low-carb/high-fat diet taking about three weeks! So make sure you pick a time when it’s okay for your training to suffer a little, and anticipate that you won’t be able to run at full intensity for a while. The off-season is a great time to change up your diet, as you shouldn’t have any serious races (aside from your local turkey trot like Turkey Day Chicago or the Gobbler Grind) on the horizon. No sugar. Don’t be ridiculous about it — it’s okay if there are a few grams of sugar in bacon to help it cure, for example. And don’t drink sugar, including “healthy” stuff like juice or sports drinks. Limit carbs in general. Stay below 50 grams per day if you need to lose some fat, go up to 100 grams per day if you’re happy with your body composition, and aim for 150 grams per day if you need to gain some weight. Play with this amount so you feel good and are fueling your activity. You may be surprised what 50 or 100 grams of carbohydrate actually look like, so keep track with a tool like MyFitnessPal and don’t just vaguely estimate. No grains. There’s no redeeming value to grains. Don’t eat them, and that includes all grains, not just gluten-containing grains. Eat plenty of protein from meat, fish, and eggs. You’ll want to keep your protein intake up during your transition to fat burning. Your body can turn protein into glucose through a process of called gluconeogenesis, so during your transition, you could burn some muscle if you’re not eating enough protein. A safe estimate is to consume about 1 gram of protein per pound of lean body mass each day. Eat plenty of saturated animal and tropical fats. Don’t be afraid of lard, tallow, palm oil, or coconut oil — that’s where you’ll get your fuel. If you’re hungry or running out of energy, eat more fat. In Part I of this series, I told you to train slow. In Part II, I told you to eat fat. Next up is Part III: Don’t let your ego get in the way. Mike Deskevich is an owner and strength and conditioning coach at Barbell Strategy in Boulder, CO. He has a Ph.D. in chemical physics from the University of Colorado and more than 16 years of strength training under his belt. In addition to spending more than 10 years in the CrossFit and weightlifting communities, he has experience both coaching and competing in CrossFit and indoor rowing. His goal is to take his experiences and combine them with the decades of research and knowledge in the strength and conditioning community to develop smart programming that makes people strong, fit, and healthy. Mike is a passionate advocate of using strength and smart nutrition to build health and fitness for life. You don’t mention dairy in this article? Good, bad, indifferent to milk, cheese, yogurt?